Located on San Leandro St between International Blvd and I-880, Extra Space Storage serves Oakland residents near Lockwood Gardens, Melrose, Coliseum Industrial, Highland, Hegenberger, Havenscourt, and Seminary. Locals will recognize our facility next to California Caster & Hand Truck Company up the street from Mobil. Extra Space Storage is about 2.3 miles from Mills College, making us an accessible option for college students who need self storage while on summer break or studying abroad. Our Oakland location is about 4 miles from Oakland International Airport, so we're a convenient option for residents who need storage units while traveling outside of the area. 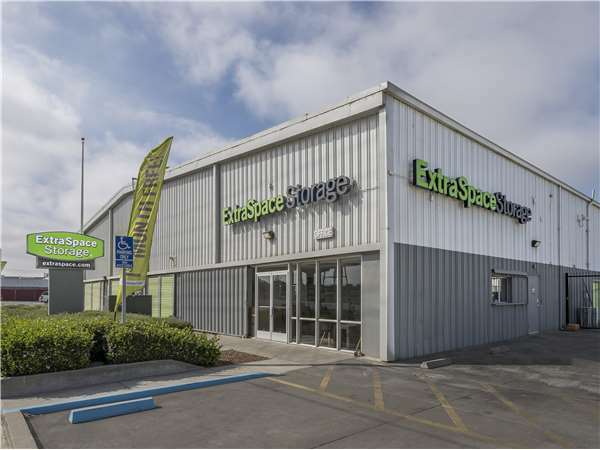 Extra Space Storage on San Leandro St offers a variety of storage unit sizes and amenities like vehicle storage to handle a wide range of needs. We're the self storage solution for you in Oakland! Storage units at our San Leandro St storage facility come in sizes 3x3 to 20x30 with features like indoor access, first-floor access, drive-up access, and elevator access. Need to store a car, motorcycle, boat, or RV in Oakland? Extra Space Storage offers 10x20 outdoor parking spaces that can accommodate vehicles of all sizes. We're committed to providing secure storage for our customers. With 24-hour video surveillance, electronic gate access with personalized entry codes, and individually-alarmed units, you can rest assured that you and your belongings will be safe at our Oakland storage facility. At Extra Space Storage, we go above and beyond to provide you with excellent customer service. From our friendly, professional staff to our well-maintained, secure facility, it's easy to see why so many choose us for their self storage needs! Contact us today to reserve a storage unit in Oakland! Facility is very clean, staff are very helpful organzied and also very respectful to my needs. Great service, convenient location and average price. I wish the hours of operation were open later, but overall, it was the best choice for me in my area. I rented a unit in another city. Same extra storage company. Great rates and sizes of the units. Are worth the dollar. Staff is always there to answer any questions i had. Controlled indoor units. My belongs were always safe. Love they take the extra step to inform on anything with my init or company chnages. The facility is clean, secure, and the price was right. The employees were friendly and helpful. HOWEVER, they have a policy of no rolling carts available when the office is not open to prevent theft, which has caused 2 issues: 1: our unit is buried in the indoor facility, so when we don't get a cart (whenever the office is closed or they are all in use, which is most of the time), it's a HUGE PAIN to move things in and out. 2: when we do get a cart, they take your drivers licence to make sure you return it, and I've had to wait 20 minutes for someone to return to the office so I can get my ID back. Bottom line, it's secure, well-priced, and with friendly folks, but unless you have your own cart to move your stuff, be prepared for some headaches. Well lighted and very clean inside and out. Very professional staff. Security on site after hours. Close to home. We moved from a competitor to Extra and are hands done happy with our decision! The facility is by leaps and bounds cleaner, convenient, fantastic customer service and besides not having 24 hr access, the epitome of what we want in a storage facility! I must say this facility has been great to me. Courteous staff, secure facility, and good price per sq. ft. Also a very clean and well kept place. Easy location to get in and out of in busy traffic. The facility(s) are acceptable however the annual $20 increase is unexceptionable for long term tenants. There is never any added value observed and the corporate bottom line is the only thing that is truly being served. GREAT LOCATION, EASY ACCESS FROM THE FREEWAY, AND THE STAFF IS VERY FRIENDLY AND KNOWLEDGEABLE. By far the best customer service I have received in a long time, questions answered and everything was handle in a timely manner. I was able to get in and out and storage size I needed. The number of changes be it pricing, accessibility or protection from the elements leave a lot to be desired. very friendly and welcoming experience by the staff. elevators smelled poorly for a while, and they have been expedient in handling that. Bart station on San Leandro St. is 1/4 south of the property. Also 1/4 North of Oracle arena and Oakland Coliseum. Directions from the East: Take Hegenberger to San Leandro St. Turn right onto San Leandro St. Site is about 1/4 mile down road on left hand side. Store Located between Seminary and 66th Ave. Directions from the West: From Airport go to Hegenberger Rd. Go beyond highway overpass to the San Leandro St Exit ramp on the right hand side of the street. Once you take the ramp you will turn to the left at the bottom of the exit. Proceed 1/4 mile to site which will be located on the left past 66th Ave.